My office’s usually chipper intern (the same one whose budget we looked at last week) surprised me on the way to lunch today when she told me she was in a bad mood. “Our society has too many problems everywhere,” she told me in English before launching into Chinese, she had seen an old woman pick food out of the garbage can on her way to work this morning. Later she told me of seeing a patient fight with a doctor over a medical bill that he couldn’t afford. The metro crash to her wasn’t so much a wake up call as it was a painful reminder of all the problems facing Chinese society. “In society, we are powerless to change,” she said loudly enough to cause me to check to see if anyone was eavesdropping. Usually such sentiments are whispered here at work, but that didn’t seem necessary today. It was upsetting to see a soon to be college graduate without hope for the future. It seems at times the Party maintains power not by gaining the favor of the people, but by making change appear impossible. Everyone I talked with today seemed to be in agreement that the subway crash never should have happened (I’m not sure if that is an actual fact, but my Chinese friends seem to think it is). The line was rushed in order to be operational ahead of the Shanghai Expo, and the faulty signal that led to yesterday’s crash was manufactured by the same company that had built the faulty signal that was behind the Wenzhou train crash just two months ago (read: Infrastructure follow up: Nanjing’s brand new station needs repairs). There had been enough time to check if other signals were malfunctioning, but nothing had been done to address the actual problem. “After the train crash, people only focused on who should be punished, but nothing was actually done about the problem,” the intern groaned. text at bottom reads "Line 10 metro experiences a low-degree collision"
To which some netizens replied, “I am angered to a low degree.” Unfortunately in modern China, 270 (or more) injuries isn’t a shocking aberration, but simply another story that will pass through the papers in a few days, much like the rash of food poisoning cases happening in school cafeterias I reported on a few weeks ago. As long as the public sees the situation as hopeless, and feels that nothing can be changed, the Party will continue to gloss over these incidents instead of addressing the actual problems. By T in Uncategorized on September 28, 2011 . “After the train crash, people only focused on who should be punished, but nothing was actually done about the problem,” the intern groaned. I think that’s exactly why many citizens didn’t support the protests in 1989. People were tired of revolutions that didn’t change anything. bobertle1950, I don’t know what is the basis of your saying “many citizens didn’t support the protests in 1989”: millions and millions of Chinese citizens swarmed streets in cities large and small during those days in 1989. They came from all walks of life in support of the calls the students made. Tom, it seems to me that you dislike China, the place that you live now, because none of your posts recorded any happy occasion or hilarious story. If you had such a terrible experience in China, why don’t you just get out of there? I’m sorry, I’m not sure how to write a happy post about the Shanghai metro crash, that would seem inappropriate. I write this blog not out of a hatred of China, but out of a tremendous love for this country and it’s people. I believe that China has the potential to be a truly great country, but first it has to address the problems that are holding it back. Things like not providing an equal education to those in the countryside, allowing wealth to collect in the hands of a few well connected party members and businessmen, ignoring basic human rights like freedom of religion and expression, and not taking actions to protect its citizens from tragedies like yesterday’s accident. If you take the time to read all 250 posts, you will find many happy occasions and funny stories too, but China is not 100% positive. Any wonder why the Chinese comtemporary writings are by and large not so great? As an aside, I participated in a literature conference several years ago in which Wolfgang Kubin served as host/moderator for several panels. An incredible man with an incredible intellect who speaks incredible Mandarin. “Me”：A little googling of 顾彬 will bring you a lot of information. As you can see from my quote (by the way, the writer I quoted is 李洱）, the way some Chinese writers took offence at him (btw, just as many, if not more, Chinese writers and scholars defended Kubin more than eloquently) reveals to us a startling narrow-mindedness, if not outright stupidity. It’s hard for me to imagine someone with such 小肚鸡肠（little belly and chicken intestines) can write great literature. Maybe you should check out ChinaSMACK if you want more flattering tales of happenings in China. Turns out Chinese people’s feelings towards their media is the same many Americans have of theirs. Always assume everything mainstream media says is a lie. If I could rate the social media,America would get a B+,while China’s rating is C-.American folks can get a chance to elevate the rating,poor Chinese should be run over by tanks at first. Oh, ask Jimmy a question: Take away the fact that Tom is a foreigner, there are millions and millions of Chinese citizens who echo what Tom writes here and the sentiments he expresses in their personal blogs, on Weibo, at their dinner tables, in their everyday conversations. What do we do about those people? Throw them out of China? Try to tell them all “滚出中国” and see what happens. 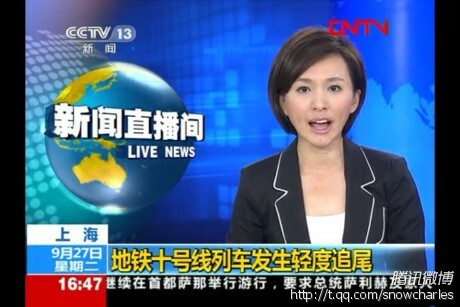 The under reporting of this subway crash by the Chinese state media hurts the feelings of the Chinese people. Me: As this is an English language Blog, I would really appreciate you providing a translation of your Comments. Most of us are not Mandarin speakers and so cannot understand your Reply. Thank you. I’m not Chinese but i would say it insults the intelligence of the Chinese people. Why do people put up with the nonsense that comes from these bureaucrats?